Summer is winding down and those long, lovely days at the beach uninterrupted by school and career schedules are all but over. Who doesnât love coming back from a fantastic afternoon on the Atlantic, driving after dusk across the PGA Bridge with its warm lights welcoming you home to Palm Beach Gardens? The iconic flyover bridge at Alt A1A and PGA Boulevard, designed by the award-winning architecture firm of Oliver Glidden Spina & Partners, was erected in 2003 and commissioned by the PGA Corridor Association with the support of the City of Palm Beach Gardens. Four towers anchor the Mediterranean-style structure and palm trees line the half-mile bridge, reflecting the name of the city as well as providing a dramatic entrance. Graceful pylons, gateposts and streetlights add the architectural finishing touches. But the truly unique and beautiful feature of the PGA Bridge is the shimmering, lighted sculptures ensconced in each of its four towers. 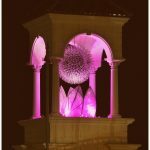 The sculptures were chosen from a city-sponsored design competition, Art in Public Places, and the artworks are covered with a mesh of programmable LED lights. The stainless steel globes gleefully reflect sunlight during the day, but itâs at night when the bridge truly comes alive. To promote civic pride or acknowledge holidays and special events, the City changes the lights several times a yearâgolf green for the Honda Classic; purple for Memorial Day; blue and green for Earth Day. The Bridge will take on a red, white and blue glow on Labor Day Weekend, September 3-5, and again on September 9-11. In the first week of October, our fallen firefighters will be remembered with red lights, followed by pink over the remainder of the month for Breast Cancer Awareness. Living in paradise has its perksâlike approaching your palace from a sparkly, turreted bridge with the sound of palm fronds rustling overhead. Sigh. Maybe just one more day at the beach. For a complete bridge lighting schedule, visit the City of Palm Beach Gardens website.